Last week we had a good group of 25 runners stretch out the miles hilly Fellsway East and Spot Pond. This week we’ll go for a flatter and a little shorter to help those legs rest up for more miles next week. If you’re running long you’ll be going about 10.8 miles, shorter you’ll do just over 6 miles. The route will start out along Main Street, heading north to Wakefield. You’ll run straight to the water stop at Nick’s Pizza on the corner of Main and Nahant, in the same intersection as Jiffy Lube and Dunkin Donuts. Running short? Turn around and head back to Brueggers the way you came. Running long? Keep on going. The long route continues up Main Street through Wakefield Center and along the eastern side of Lake Quannapowitt to the right. You’ll complete a counter clockwise loop around the lake by turning left at the northern end of the lake into the Converse parking lot. Follow the path over to North Ave where you turn left. When you get to Church Street turn left and follow that until you get to the church. Turn right on Common Street at Wakefield Common which will merge you back to Main Street. Keep running through Wakefield Center and back to the water stop. After the water stop continue down Main Street back to Brueggers. I’ll handle the water stop. See you at 8AM in front of Brueggers. Who’s in? ROLL CALL! This week the S in SLR stands for Saturday. Why? Because we have the MRC Summer Party Saturday night and I don’t want anyone leaving the party early because they have to run in the morning. Last week was good, a bit hot, with 24 runners starting up their training with an easy run. This week we’ll stretch the miles out a bit: 12.5 for the marathoners, 7.1 for the half marathoners. The route will take us along Main St towards Malden, turning right on W Wyoming, out to Grimsbys. Take a left onto the Fellsway East and follow that to Highland Ave. A right on Highland will bring you up to Water Stop 1. From the Water Stop, short distance runners go right, long distance runners go left. Shorter runners will run to Pond Street and turn right back down to Grimsbys. Left at Grimsby’s, right on Melrose, right on Main and back to Brueggers. Longer Distance runners go around Spot Pond: Elm Street to Main Street, cut through Straw Point, bear Right on South Street and keep running back to the Water Stop. Once you get there continue up to East Border Road where you’ll go left to the Fellsway East. Follow the Fellsway East past Grimsbys to the LynnFells Parkway. Right on Melrose, right on Main and back to Brueggers. Water Stops: I’ll do the water stop. If I have a volunteer there will be more water along the way. Anyone? That’s it. Who’s in? Roll Call. Welcome to the 2014 Fall edition of the Sunday Long Run! The program is geared towards training for the Baystate Marathon and its associated Half Marathon but little adjustments in mileage here and there will get you ready for any long distance race. We’re here to provide you with a structured and supported long run every Sunday from here to mid-October. For marathon trainees, the schedule is set up to increase your mileage from 10 miles (which you should be able to do comfortably) to 22 miles (the recommended longest training distance for a marathon). For a half we bring you up from 4 miles to 11. This is intended for a beginner half marathon, if you are a more experienced half marathoner you can be more aggressive with the miles. There are ways to cut from the marathon training distances or add to the half marathon distances to get more miles. I typically suggest an experienced half marathoner to get a good training run up to 15 or 16 miles in a few weeks before their race. Other than the long run, the rest of the training is up to you. A typical routine is the Sunday Long Run, a recovery run on Tuesdays, a speed training run on Thursdays, and “junk miles” on Friday. Depending on how well you recover you can add another easy run on any other day, or skip the Friday run and recover more. Its up to you, learn your body. The Sunday Long Run is about training your entire body for a marathon. Your legs do most of the work, but your mind and your stomach are very important peripheral systems to keep your engine running for hours. Talk to other runners and learn how they succeed in long distance races. Try different foods and drinks along the way (typically new things should be tried during shorter runs and at the last water stop) and find out how your body reacts. Experiment with meals on Saturdays and Sunday morning to see how they help or hurt your Sunday Run, as well as meals on Sunday afternoon to figure out what helps you recover the best. The point is this isn’t easy, learn how to do it along the way. With all that said, lets get on with the running. We’ll meet slightly before 8AM at Brueggers in Melrose. It’ll be nice out so we can meet outside on the sidewalk. Remember, Brueggers didn’t invite up, we invited ourselves… be wary that they are a food industry business and our presence there effects their customers impression of them. Try to stay out of the way of the bagel line and the cash register. Steer clear of patrons eating their breakfast at tables inside and out. Try not to be overly loud in your pre-run conversations. And after the run, patronize their business, and tip generously. They provide us a comfortable place to meet and a bathroom to use for free. At 8AM I’ll go over the route with you and send you off. 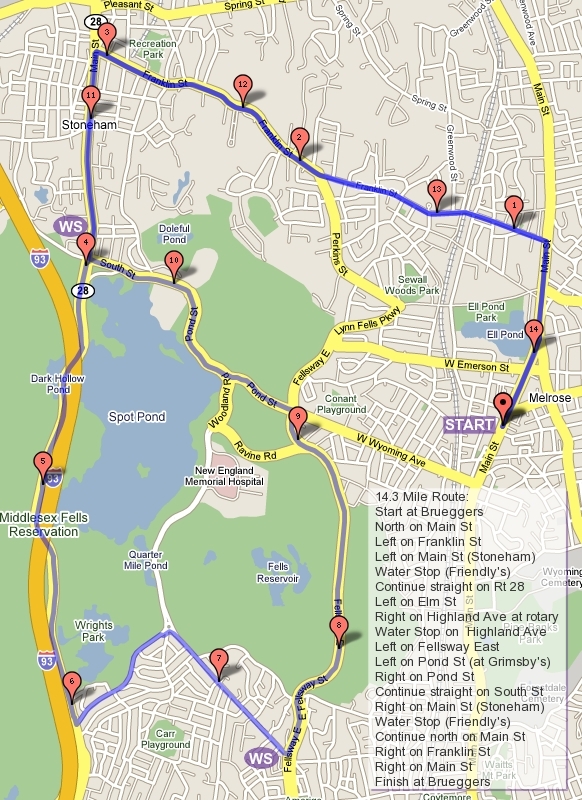 Note that all the routes for the entire training are mapped out in the link to the right of the Sunday Long Run webpage. Print one out and bring it with you for reference. You’ll get sweaty so a good trick is to put it in a plastic baggy. This week we’ll run down Main Street towards the LynnFells Parkway. We’ll cut to Green Street on the right, by Melrose Wakefield Hospital, and follow that to a right on the LynnFells Parkway. Follow the Parkway to Main Street in Saugus (the first set of lights you get to) and be careful to use sidewalks or run single file along this road. People drive fast and there are spots where visibility isn’t great and the road side is narrow. Be aware that not all drivers are aware you’re there! At the set of light turn left. Note to shorter runners, the map says to turn left prior to Main Street, ignore that and go all the way to Main Street. Shorter distance runners turn left at the next set of lights onto Howard Street. I’ll have a quick water stop there for you. I’ll man it for most of the time, but you just might find a jug of water and cups and a plastic bag. Grab a drink and put your trash in the bag, I’ll pick it up later. Once you’re done there follow Howard Street back to Green Street. Take a left on Green and follow it back to Main Street and follow that back to Brueggers. You’re done! Longer distance runners follow Main Street in Saugus which will become Farm Street in Wakefield. You’re roll over a few hills along the way and find Wakefield High School where we’ll have the first water stop of the year for you. Drink up, have a little snack, and keep on moving! Continue on Farm Street to a set of lights at a T intersection. This is Water Street where you’ll go left to Wakefield Center. When you get to the center you’ll go left on Main Street. This street will bring you back to Melrose and back to Brueggers. You’re done! Then we’ll sit around and have coffee. I forgot to mention, short runners bring a dollar to cover you water stop supplies, long runners bring two dollars. If you want to commit to a full season of running and not have to remember to bring money each week you can give me $15 for the half training season and $30 for the full season. Any Questions, post them here, I or someone else will gladly answer. So who’s in for the Fall of 2014 Sunday Long Run Training Season? It’s time for the weekly ROLL CALL!! !